Prominent & Leading Manufacturer from New Delhi, we offer Dustless Board Chalk, School Chalk, Dustless Chalk, Color Dustless Chalk, Coloured Chalk and Blackboard Chalk. 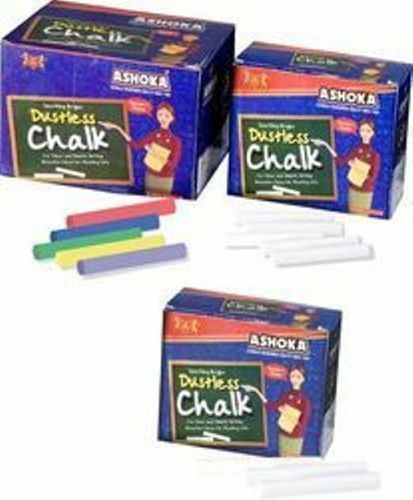 We are reckoned organization of this domain engaged in offering an enhanced quality Ashoka Dustless Board Chalk. We are reckoned organization of this domain engaged in offering an enhanced quality Ashoka Dustless Chalk. We are reckoned organization of this domain engaged in offering an enhanced quality Ashoka Color Dustless Chalk. We are reckoned organization of this domain engaged in offering an enhanced quality Ashoka Coloured Chalk. We are reckoned organization of this domain engaged in offering an enhanced quality Blackboard Chalk.